Found on Brighton: Welcome to Advent Words 2017! Advent officially begins on Sunday. We are just two short days away form the beginning of the season and the art challenge! In the midst of preparing for the holiday - buying presents, preparing for meals, attending events - we can slow ourselves down for just a bit each day and delve into Advent and what is most important about Christmas ~ Jesus Christ. Advent has been call a "two-fold gaze", looking back we remember that Christ has come, while getting in touch with the longing the Israelites had for the Messiah. Looking forward we anticipate Christ's promised return. The word Advent simply means "coming", taken from the Latin word adventus. In her book Come, Lord Jesus, author Kris Camealy says, "Advent in the church, is a season of preparation rimmed with hopeful expectation." My practice of Advent preparation over the past years has been to reflect on Scripture passages, quotes and devotions through art journaling. 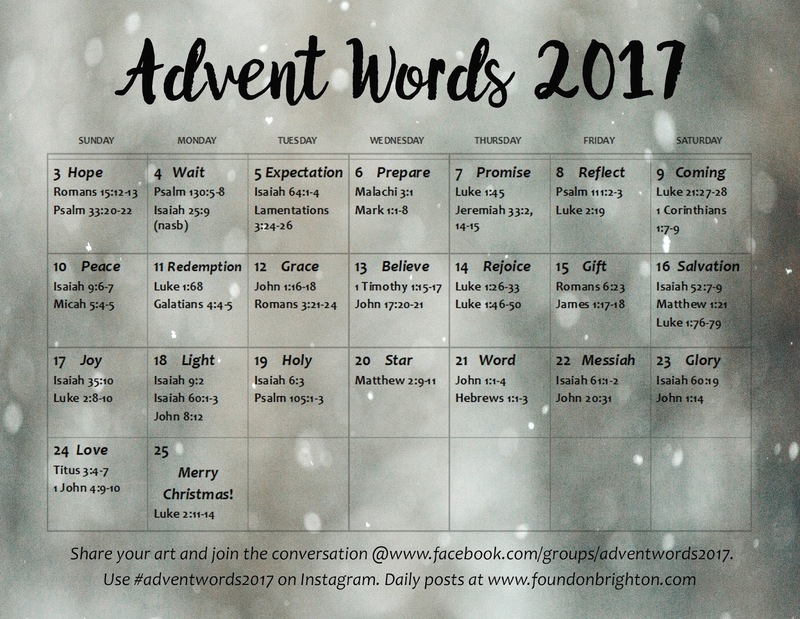 This year I have launched my own Advent art challenge (see original post here), and today I am sharing the prompt calendar to give those participating time to prepare before we begin on Sunday. Participate in any creative form you choose ~ art journaling, commonplace book, photography, poetry, memory keeping, collage, etc. If you would like to download a PDF of the calendar you can do so here. Warning: it is a large file. You can also join our Facebook group: facebook.com/groups/adventword2017. There you can share your art and join the conversation. You can share on Instagram as well with #adventwords2017. Join us!